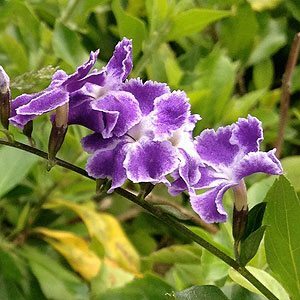 The “Geisha Girl plant” is a modern day variety of an old favourite Duranta erecta. A very hardy plant with an upright growth habit. It is the masses of colourful flowers that make this such a popular plant, however it does have its problems. The issue of weed potential is the major drawback, however this can be prevented by deadheading after flowering and growing in a container. Originally from Mexico to South America, although the natural climate is warm to sub tropical it can be grown in cooler climates. In warmer climates it will be evergreen, in cooler climates it will be deciduous or partly deciduous. Deep green foliage and mauve to purple flowers edged in white make this a plant that will ad colour to any garden. It is plant that has small spines or thorns so it is best planted way from traffic areas. Full sun is best both for foliage growth and flower formation. Best in a humus rich well drained soil, although regarded as drought tolerant this is a plant that will benefit from extra water during dry periods. Fertilise with any slow resale fertiliser once a year, or simply apply a top dressing of aged cow manure, blood and bone and mulch once a year. This is a vigorous plant so regular pruning will be required to keep the plant compact and bushy. If you want to train the plant as a stemmed shrub, start at an early age and simply prune to one central leader until you reach the desired height. You may need to stake a plant trained this way. Best from hardwood cuttings taken in summer. The root system is vigorous and can be difficult to remove. The plant can also self seed, so remove all spent flowers heads to prevent this. This will also help prevent fruiting.